Posted on Fri, Nov 11, 2011 : 5:58 a.m.
Nick and Yen Azzaro offer art and design services with their business Chin-Azzaro. 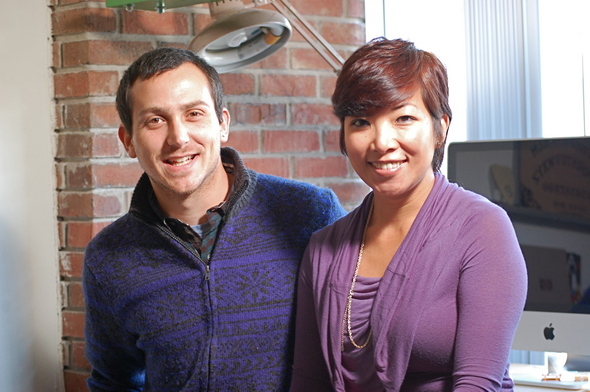 Nick and Yen Azzaro set out to make Ann Arbor a prettier place, one room, office or business at a time. The two University of Michigan School of Art & Design graduates spent seven years after graduation sharpening their skills in Chicago - Nick as a commercial and art photographer and Yen as director of a gallery and consulting on fine art. But the couple recently returned to Ann Arbor and this month launched what they say is a unique collection of art and design services under their business banner, Chin-Azzaro. Chin is Yen’s maiden name. The new art and design firm offers a plate full of services, including commercial and portrait photography, commercial and residential mural painting and appraising and consulting about art. They even have services for young customers, Chin-Azzaro Kids, with bedroom murals, custom party invitations and family and child photo portraits. “We want to be trendy, but not in a fad kind of way. Very contemporary, but based on art history,” Yen said. While the Chicago market was vast enough for them to specialize, they are casting a wider net in Ann Arbor. “We knew coming back to Ann Arbor, we didn’t expect to do what we did in Chicago,” Yen said. They returned to Ann Arbor to be closer to family. “We both offer something different to the company,” Nick said. Yet, they complement one another. For instance, if Nick has a photography job shooting furniture either for commercial purposes or for a private home, Yen can work on the staging, making sure the angles are right and the pillows placed and fluffed. “We like to work as a team,” Nick said. Yen will incorporate her gallery work in Chicago, working with museums and private collectors buying and selling art, in the new business. She will help businesses and individuals purchase and display art. “You don’t have to buy poster art. There is affordable art out there, it doesn’t have to be from Bed, Bath & Beyond,” Yen said. She’ll consult on framing and art placement, even hanging the art. She’ll continue to appraise and consult on art. One of the firm’s first jobs was a referral through the art school to consult with a customer on cleaning an oil painting. But she’ll also return to her college roots of painting wall murals. She’s working on a mural for the waiting room of an Ann Arbor dentist. She has been visiting Ann Arbor furniture stores, salons and cafes, looking for vacant walls. “I’ve been looking for lonely looking walls that need art or a mural,” she said. Murals don’t have to be ornate wall-to-ceiling projects. A small mural can add a splash of color to an entryway or even around a light switch. She’s marketing murals for home, business and office. Nick will continue the commercial photography work he did in Chicago, where he shot food and products, from Sears tools to the Republic of Tea. He also went on location for National Geographic, shooting products for their retail catalog. Chin-Azzaro offers photographic services to restaurants and private chefs along with portraiture for CEOs, Facebook pages and senior pictures. Nick will also test the market for event shooting, such as business openings and conferences. He’s already working on photographing a yoga studio for a website and shot dinnerware for a local graphic artist. Fri, Nov 11, 2011 : 8 p.m.
Nice article, best wishes to both of you!